The undersigned is directed to invite attention to this Departments OM No. 1-6/ 2016- C dated 3rd August, 2017, explaining in detail the methodology for applying the principle of "bunching" consequent upon pay fixation in the revised pay scales (applicable Levels of the Pay Matrix) effective from 1.1.2016 based on implementation of the recommendations of the 7th Pay Commission. 2. 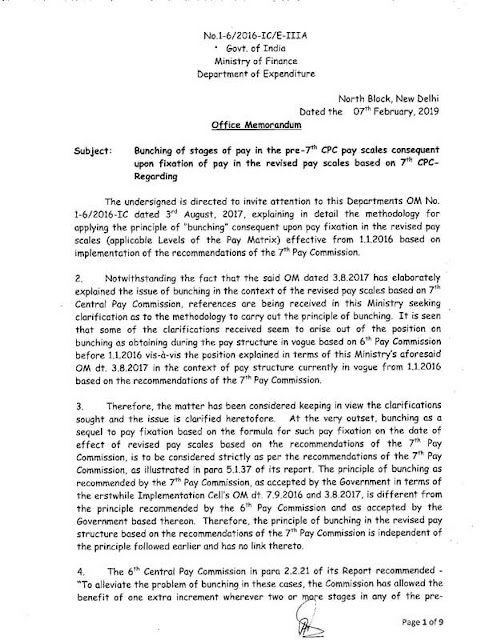 Notwithstanding the fact that the said OM dated 3.8.2017 has elaborately explained the issue of bunching in the context of the revised pay scales based on yth Central Pay Commission, references are being received in this Ministry seeking clarification as to the methodology to carry out the principle of bunching. 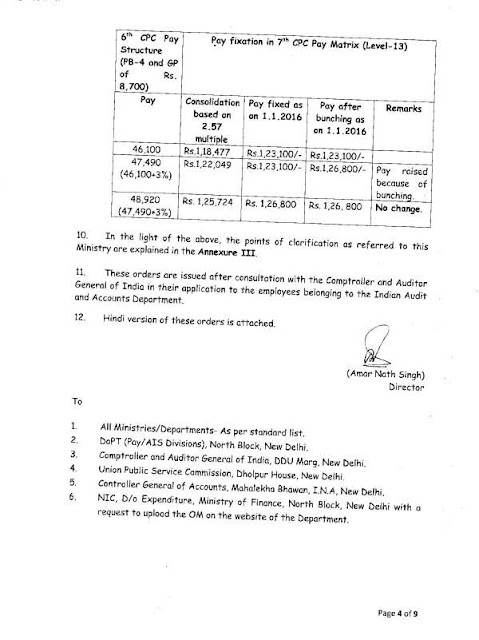 It is seen that some of the clarifications received seem to arise out of the position on bunching as obtaining during the pay structure in vogue based on 6th Pay Commission before 1.1.2016 vis-a-vis the position explained in terms of this Ministry's aforesaid OM dt. 3.8.2017 in the context of pay structure currently in vogue from 1.1.2016 based on the recommendations of the 7th Pay Commission. 3. Therefore, the matter has been considered keeping in view the clarifications sought and the issue is clarified heretofore. 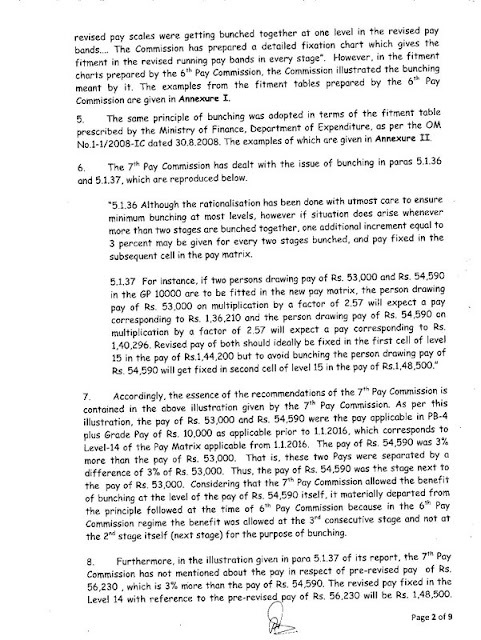 At the very outset, bunching as a sequel to pay fixation based on the formula for such pay fixation on the date of effect of revised pay scales based on the recommendations of the 7th Pay Commission, is to be considered strictly as per the recommendations of the 7th Pay Commission, as illustrated in para 5.1.37 of its report. The principle of bunching as recommended by the 7th Pay Commission, as accepted by the Government in terms of the erstwhile Implementation Cell's OM dt. 7.9.2016 and 3 .8.2017, is different from the principle recommended by the 6th Pay Commission and as accepted by the Government based thereon. Therefore, the principle of bunching in the revised pay structure based on the recommendations of the 7th Pay Commission is independent of the principle followed earlier and has no link thereto. 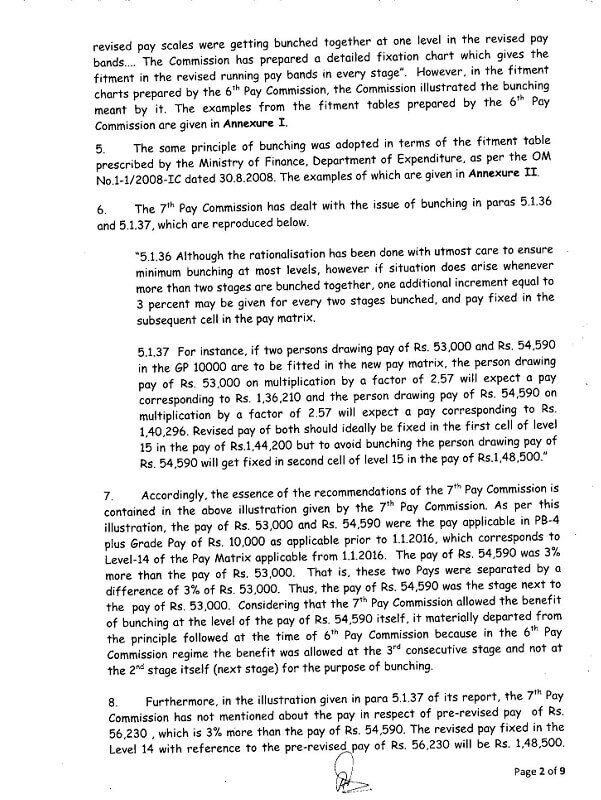 "5.1.36 Although the rationalisation has been done with utmost care to ensure minimum bunching at most levels, however if situation does arise whenever more than two stages are bunched together ,one additional increment equal to 3 percent may be given for every two stages bunched, and pay fixed in the subsequent cell in the pay matrix. 5.1.37 For instance, if two persons drawing pay of Rs. 53 ,000 and Rs. 54,590 in the GP 10000 are to be fitted in the new pay matrix , the person drawing pay of Rs. 53.000 on multiplication by a factor of 2.57 will expect a pay corresponding to Rs. 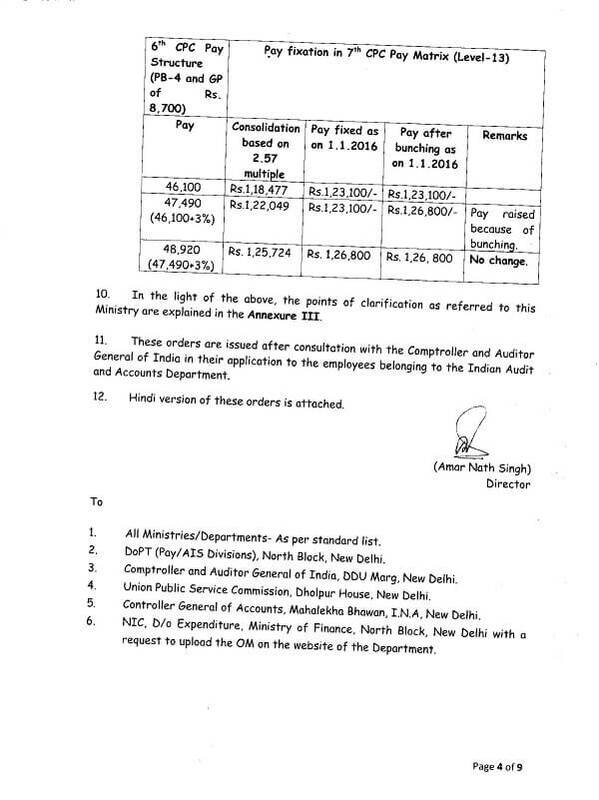 1,36,210 and the person drawing pay of Rs. 54,590 on multiplication by a factor of 2.57 will expect a pay corresponding to Rs. 1,40 .296 . 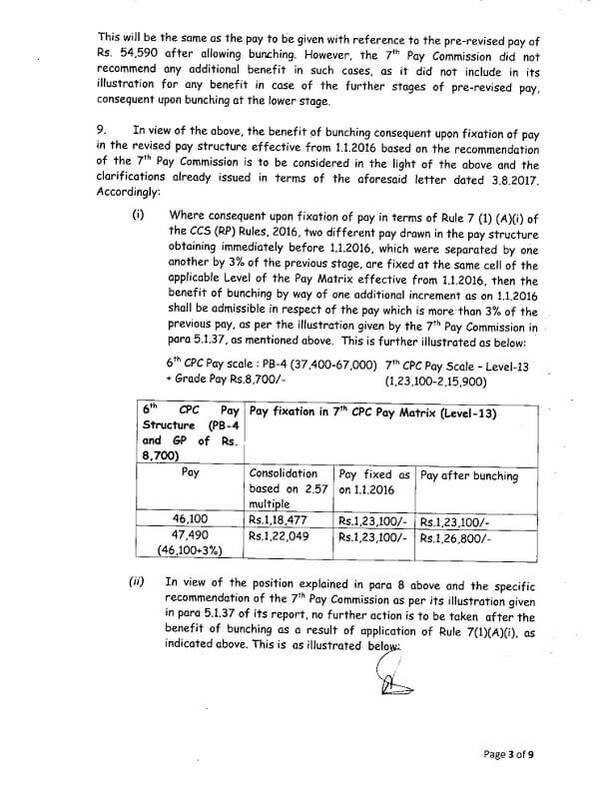 Revised pay of both should ideally be fixed in the first cell of level 15 in the pay of Rs.1.44,200 but to avoid bunching the person drawing pay of Rs. 54.590 will get f ixed in second cell of level 15 in the pay of Rs.1.48,500."